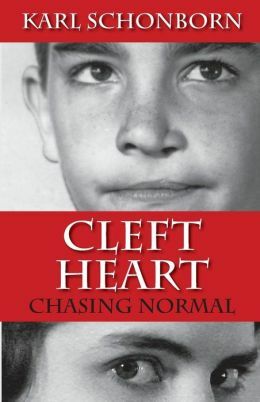 Cleft Heart, by Karl Schonborn, is a multifaceted memoir, covering his life in great detail, from birth to adulthood. In the process, several different themes interweave to create the whole of Schonborn’s experience growing up in the 1960s. The main theme, which underlies all the others, is that he was born with a severe cleft palate. The resulting heroism of his parents—especially his mom—in dealing with doctors and hospitals and operations for decades to fix this problem, is amazing. And since memoirs are written in first person, readers also learn of the mental stress all this put on him, and how well he coped, how well he made decisions—even as a kid—to deal with the bullying from others, and the intense frustration from knowing he looked different. Feeling different is of course a common teenage experience. Most people experience teen angst in the course of growing up. Karl, though, had the added pressure of looking and sounding physically “different.” Despite all the surgeries, he still had a very nasal sounding voice, and every mirror reflected the scars and imbalance still present in his face. However, a saying that was common in his family was “Don’t put your wishbone where your backbone should be!” Time after time, he shows “backbone” in dealing with the frustrations of his life, determined not to give in, but to work harder. This work ethic, this determination, results in a very successful life for him, despite his initial handicap. He studies hard in high school, resulting in a scholarship to Yale. Denied participation in sports because of a doctor’s fears of a heart problem, he takes up debating, forcing himself to work on his voice, and his presence speaking before a crowd. This results in debating championships at Yale, and ultimately his delivering lectures to students, convincing himself that he could be a professor. His intelligent decisions in the face of problems are also a key part of his story. Destined at first for medical school, he has the backbone to change his mind over his family’s expectations. Planning to be classified as a conscientious objector after he drops med school, he is shocked to find his “alternative service” plan blunted when he’s classified 4-F. A plan B emerges though, and he decides to travel for a year before returning to grad school. Seeing the world brings him many interesting experiences, and a much more mature young man returns to California. Other aspects of Karl’s story are his love life—an up and down rollercoaster, part of still overcoming his cleft palate. He also grows through many major events of the 60s: Viet Nam, desegregation in the South, riots in the cities, the assassination of John and Bobby Kennedy. Through all these, he took wise paths to avoid trouble, but he also developed keen interest in the roots of violence, which ultimately led to a change in his life’s goals. And along the way, he met some well-known people: Olympic swimmer Steve Clark, Yale student John Kerry, and singer Joan Baez—who, like him, graduated from Palo Alto High. All in all, Cleft Heart, Chasing Normal, is an inspiring story of a young man who focuses on backbone more than wishbone, overcoming many hardships and traumas on his way to a successful adulthood. There are many “normal” parts of his life, but they only become so through his determination to succeed, and the sensible choices he makes along the way. A tad of a spoiler, but many prefer the journey to the destination.